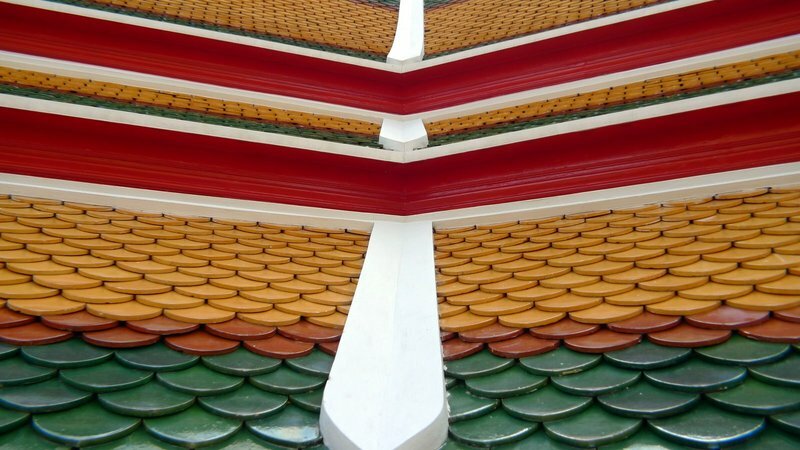 More than halfway through our seven different modes of transportation, Matt, Craig, and I ended up arriving at the Grand Palace just as it was closing, so instead we walked down the block to Wat Po, also known as the Temple of the Reclining Buddha. 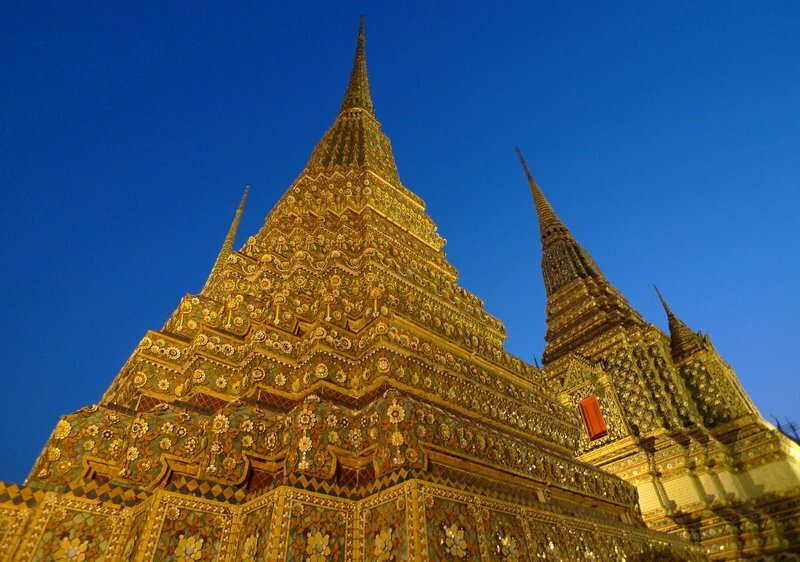 This temple, which tourists usually see after sweltering in the hot sun over at the Grand Palace, rarely gets as thorough a viewing as it deserves. 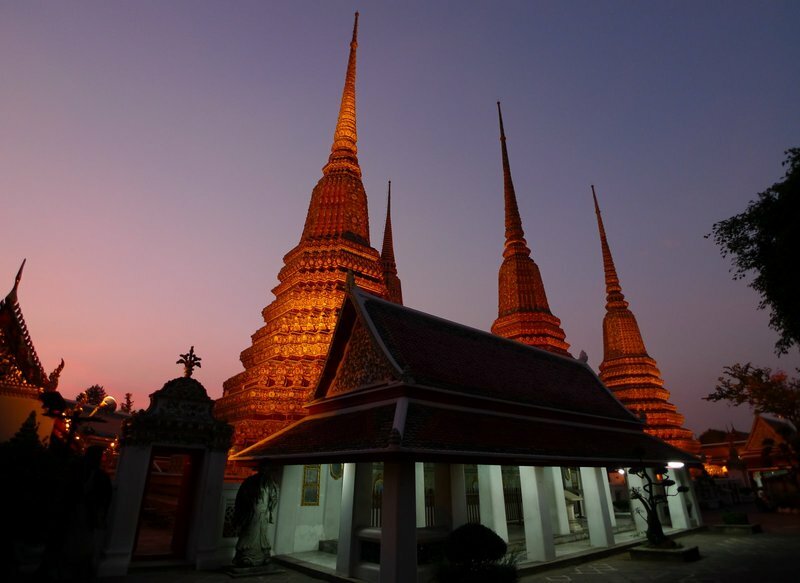 Predating the founding of Bangkok, the temple houses a 15 meter (46 foot) high, 46 meter (140 foot) long statue of the Buddha in a reclining pose, covered in gold plating with mother of pearl inlays on the soles of its feet. That the soles of the feet are so prominent seems appropriate, because Wat Po is also the home of traditional Thai medicine, a large portion of which is massage. Thai massage uses a combination of stretching and deep tissue work and can be very therapeutic. In fact, a well-regarded school is located on the temple grounds and my visitors stopped in for an hour-long foot massage. The temple is in the final stages of extensive renovations, and the entire place seems alive with color and light. 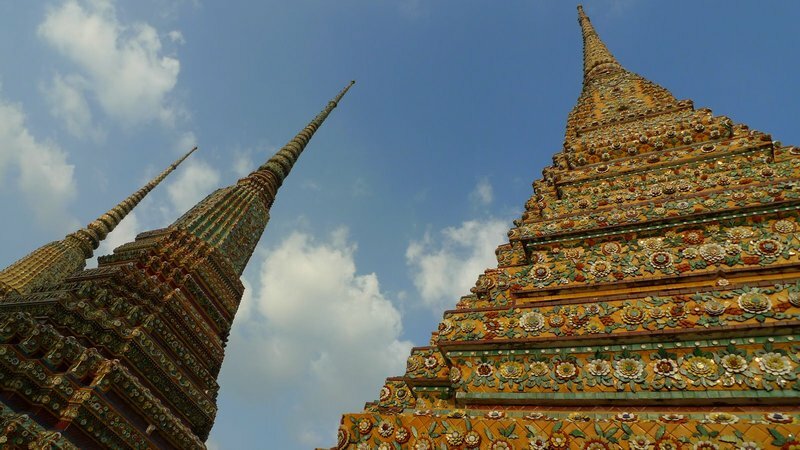 Here are a trio of chedis, which contain the remains of various members of the Chakri dynasty. The current king is the ninth member of this dynasty. New roof tiles and paint seem to almost pulsate with color. 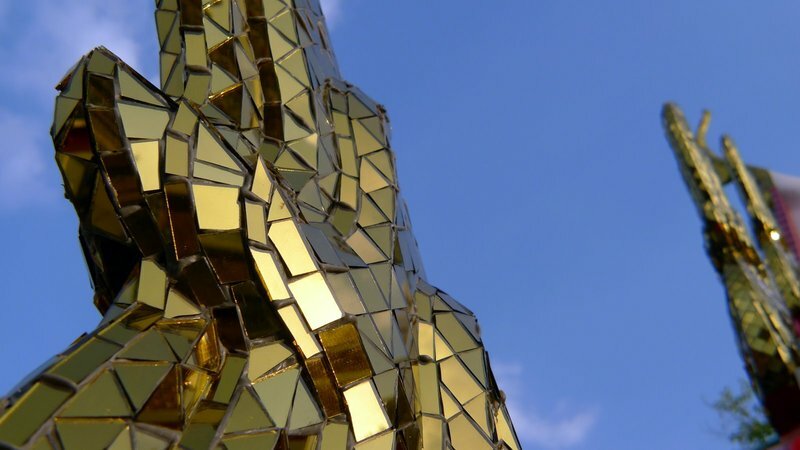 And mirrored tiles catch the sun from every angle. While there, we came across a group of university students who are studying tourism. They had to film themselves giving a speech (in both Thai and English – the Thai version is on the other side of the cue card) about the temple. I watched for a few minutes and then asked some questions, thoroughly embarrassing the young ladies. The upside of my guests getting massages was that we were at the temple well after the time that tourists normally leave. The temple’s website still lists the closing time as 5:00 pm but almost half a year ago they extended it to 9:00 pm every night. The temple is beautifully illuminated as the sun goes down and is all the more enjoyable and inspiring when it is almost completely devoid of tourists. With the sun going down early now that we are heading into winter, the sky quickly went through various shades of blue to pink to purple, making for some amazing contrasts with the vivid hues of the chedis and temple buildings. There are many spotlights to bring out the details of the structures, including these decorations made from shards of broken Chinese pottery. Almost looks like the decorations on a cake, doesn’t it? 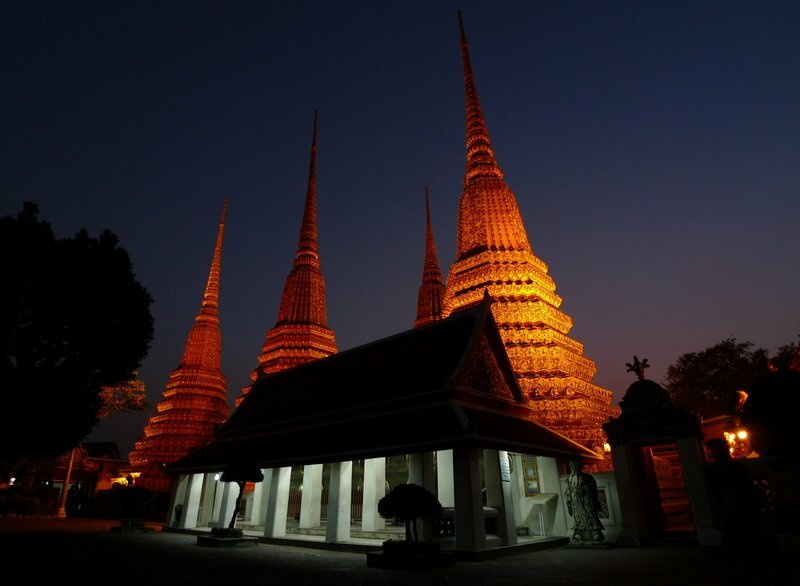 This entry was posted in Uncategorized and tagged Bangkok, Buddha, culture, Krungthep, Reclining, Temple, Thailand, Wat Po by christao408. Bookmark the permalink. Your photos are so vivid and beautiful. The photos taken during the sunset are really great! those night shots of the temples are amazing! The reclining Buddha and the stupas are as spectacular as always. The weather should be nice and cool at this time of year? 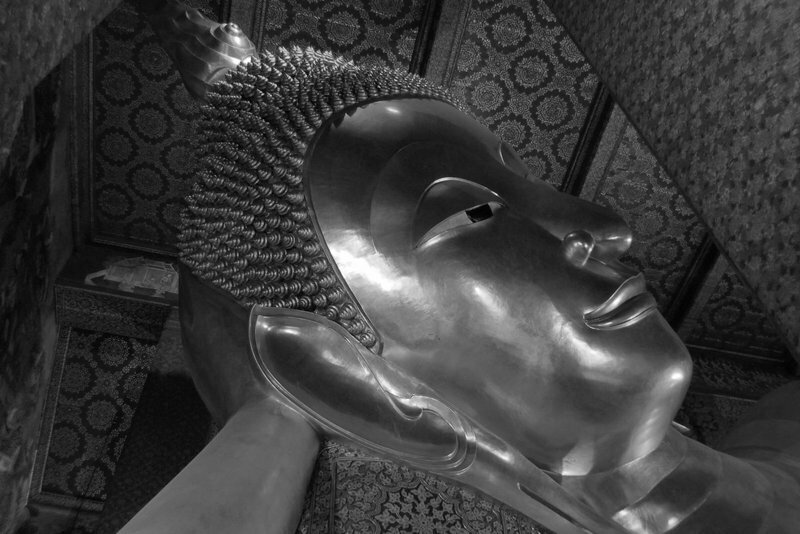 I visited the temple several years ago, and remembered tryinig to take a picture of the budha, almost impossible task. That place look gorgeous after the renovation and the night shots are simply out of this world beauty. I need to remember to visit it in the evening next time. The temple is stunning in the evening!!! You took some excellent photos – made it seem I was there looking at the Temple. I particularly enjoyed the evening photos. It looks amazing there! My dad has this chinese book on foot massages that he used to swear by. I think it’s based on the Thai massage styles or something. He used to use me to experiment on his techniques, but I always feel like he’s trying to break my foot in half or something! The temples are quite something, do you get to visit them a lot or is it quite a trek to get there? Wow! How lucky that the palace was closing! These are beautiful photos and commentary. Thanks for the tour. I have been to the temple but never paid so much attention to the intricacies. When I was younger, I never paid attention to anything like culture or buildings or nature. I only want to go shoppping. Every photo had me in it. How I change, I don’t like myself to be in photos now. Your photos are really beautiful. Thank you for sharing. wow, those are some great photos! looks like one of those must-visit places, particularly for camera enthusiasts. @bengozen – The camera is a Panasonic Lumix LX-3 (although the new LX-4 is out now) which has excellent Leica optics, very good low-light performance, and a wide-angle 22mm lens. I shot these with an 18mm attachment to get an even wider angle. Highly recommended. @kunhuo42 – It most definitely is a place for photobugs to visit. @icepearlz – It is easy, especially when you are younger, to not appreciate the details and intricacies of a place like this. In fact, “temple burnout” is common as after a few hours out in the heat and humidity, tourists start to have a hazy view of one temple after another. @aPieceOfTheSky – I’m glad you enjoyed it. Yes, another trip is overdue, I’m sure! @murisopsis – Yes, our being too late for the Grand Palace ended up being a blessing in disguise. @AzureRecollections – The foot massages are a key part of Thai medicinal thought, kind of a reflexology thing. Generally, I find the whole body massages to be a bit too rough for my taste (although many people find them wonderfully therapeutic) but the foot massages are enjoyable. I think I buy into the idea that the soles of the feet are linked to all the various parts of your body, since you are on your feet all day! 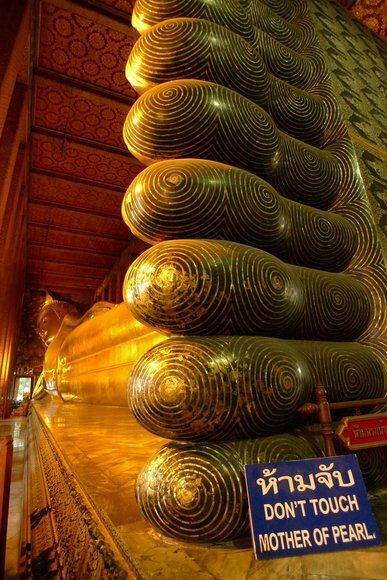 @stevew918 – It is always funny watching people try to get the picture of the reclining Buddha because unless you have a pretty wide angle lens, you just can’t get the whole thing. Knowing we were going to go to the temple was one reason I brought my 18mm wide angle lens. @CurryPuffy – We haven’t had as much cold weather yet as I would care for. That said, it isn’t like it was 34 and 80% humidity, but the day we were out it was probably 31 and 60%, so still a warm one in the sun. Thankfully, there are breezes down by the river. 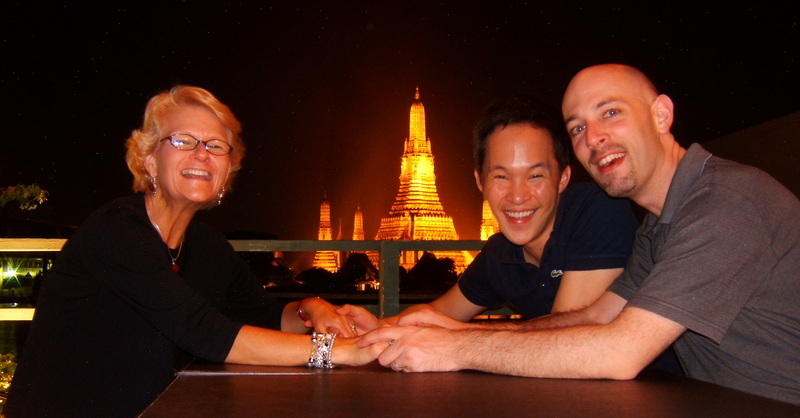 @Redlegsix – It would be very satisfying for you to make a return to Thailand all those years after you lived here. Hopefully, Pat will come around one of these days. The pictures are wonderful. It’s great that Wat Po ss now open at dusk and the contrast to the night sky is gorgeous. Your camera is great at low light and you really brought out the best in it. 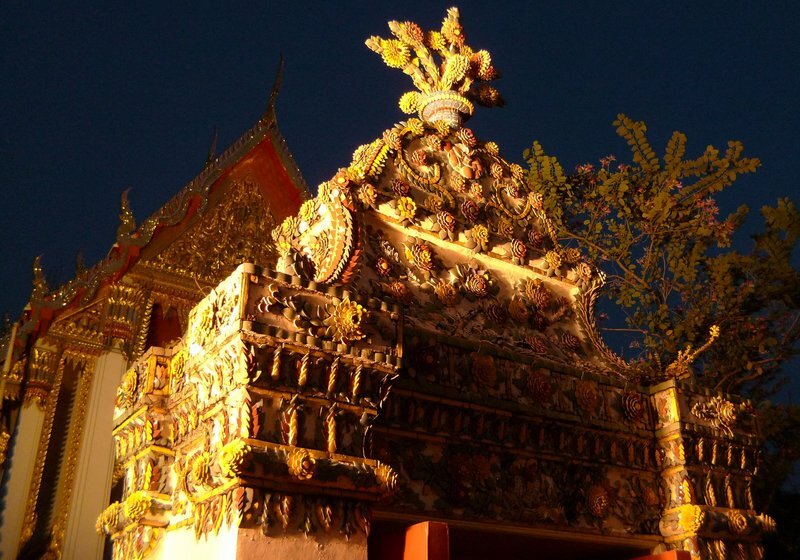 @AzureRecollections – that temple and the Palace is in the middle of the city. @ElusiveWords – Thanks for catching his second question for me. Thanks also for the kind words. I hope you are doing well. @Chatamanda – They are very breathtaking. Glad you are back at Xanga! @ElusiveWords – =O for some reason, I expected it to be a long hike away and hidden in a valley somewhere. @christao408 – I wish my dad didn’t take that book so seriously. Every time I cringe in pain, he jumps to the conclusion that something is wrong with a particular organ, and then increases the pressure he uses…. inciting more pain, which confirms his suspicions. It’s a horrible cycle. @AzureRecollections – oh gee, I’m trying real hard not to laugh at your dad’s attempt to massage your feet but… *muffled laughter*. I hope you are fleet of foot and able to avoid him.